Just like that, I’m gone. A few minutes earlier I was driving past homes filled with people that were sleeping or having breakfast or getting ready for work. I made a quick turn, whipped my truck into a spacious gravel parking lot, walked past the trail sign and tumbled off the edge of civilization. For the next few hours, I’m not a contributing member of society. I’m a hiker. With my phone turned off I rambled into the desert and vanished. That’s the power of a trail. It pries you free from the soul-crushing grip of minor responsibilities. Obligations are brushed aside and errands are postponed because, for now, I’m hiking. I chose Granite Mountain Loop for my escape. 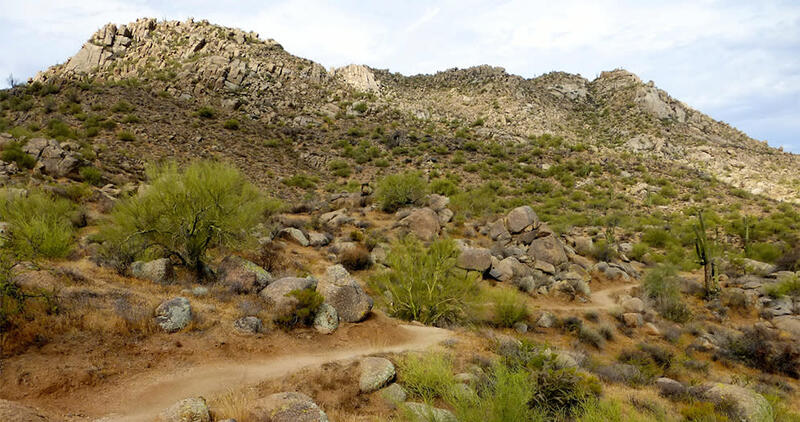 It’s a boulder-strewn peak, one of five prominent mountains in the northern half of the McDowell Sonoran Preserve. From the simple Granite Mountain Trailhead (no water or restrooms but plenty of parking) I set out on the Bootlegger Trail, angling northwest towards a rocky skyline. For 0.7 miles Bootlegger weaves through a corridor of big stone slabs and quiet pools of desert. I turn onto Saddlehorn for a short jog before connecting with Granite Mountain Loop. The trail hugs the lower slope of the mountain as it makes a languid circle around it. This is a deliciously peaceful stretch of scenic desert and on several occasions I remind myself that I’m still in luxurious Scottsdale. The combination of curiously stacked boulders rubbing rough elbows with a forest of cactus keeps my head on a swivel. There’s always some new shape to see, a fresh detail to focus on. Most people consider rocks to be inanimate but here they have character and personality. Here they have a voice. This is a land of texture and light. A raft of low-flying clouds gathers but are frequently speared by shafts of sun. I feel like I’m being winked at by angels. Granite Mountain changes appearance once I’m hiking along the western flank. It seems steeper, more rugged. I make a short detour, turning onto the Balanced Rock Trail. It’s only 0.3 miles to the namesake formation, a weird multi-ton mushroom of stone that has no business still being upright. I find a nearby shady spot for a rest break but keep my camera handy. If Balanced Rock decides to topple, I’ll document it and become a YouTube sensation. 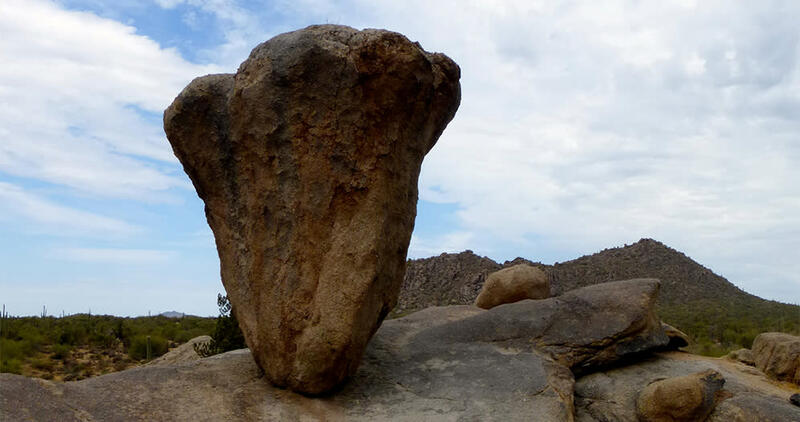 Spoiler alert: Balanced Rock still stands. Finishing my loop around Granite Mountain, I reach the junction with Saddlehorn Trail and for the first time notice the distinctive formation that inspired the name. So I understand how Granite Mountain, Balanced Rock and Saddlehorn trails got their monikers. I’m still hazy on Bootlegger. Hiking back to my truck, I peer intently into rocky alcoves looking for a stash of old-time hooch, but no luck. Back at the trailhead, I know it’s time to turn my phone back on and rejoin society. But I’m grateful to Granite Mountain Loop and its supporting cast of trails in McDowell Sonoran Preserve for giving me an amazing morning, all to myself. What the heck… I think I’ll wait until after lunch to turn on my phone.